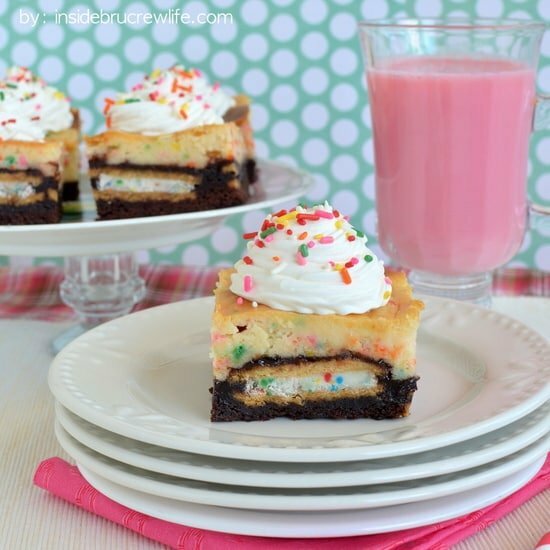 This White Chocolate Funfetti Chip Cake is an impressive dessert for any picnic or party. 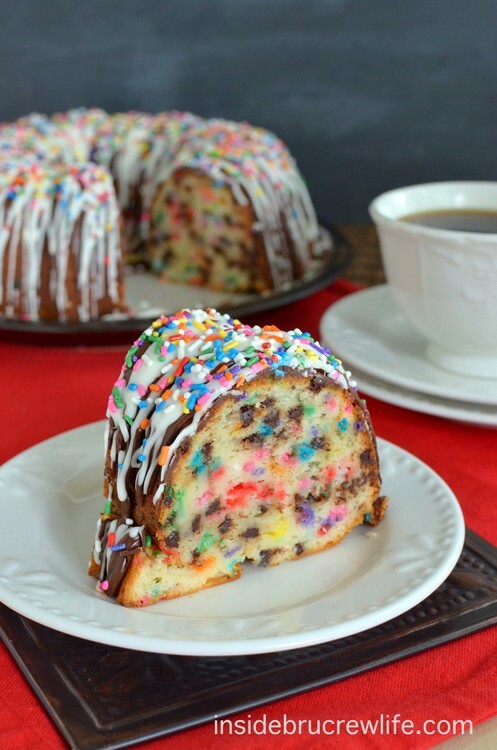 Cake with sprinkles and chocolate on top and inside is sure to have you coming back for more. I have a confession to make. It’s nothing big and crazy. Just something about me that if we are going to be friends, you might want to know. I am late to everything. Time is just not my friend. I try to do things quickly, but I get distracted…squirrel!!! Or things take me way longer than I anticipated. Want to know what makes this bad habit of mine even worse? Being late is probably my husband’s worst pet peeve. I know this, and I honestly try so hard to be on time for things that he attends. But 9 times out of 10, I’m going to show up late. If everything started after noon, I think I would do better. I’m as slow as a turtle when it comes to getting ready or having stuff done in the early morning hours. Coffee doesn’t even help me be faster. Want to know my secret to getting my kids to school on time? I jump out of bed and put a hat on. Yup, that’s right. My pj’s and I make it to school almost every morning before the bells ring. There have been a few times we have run late, but not usually because of me. Thank goodness for yoga pants and tshirts. Does anyone else suffer from lateness-itis? If you have or did, any tips on improvement are more than welcome. Especially a cake covered in sprinkles and chocolate. This is sure to make someone smile when you walk in late carrying this. 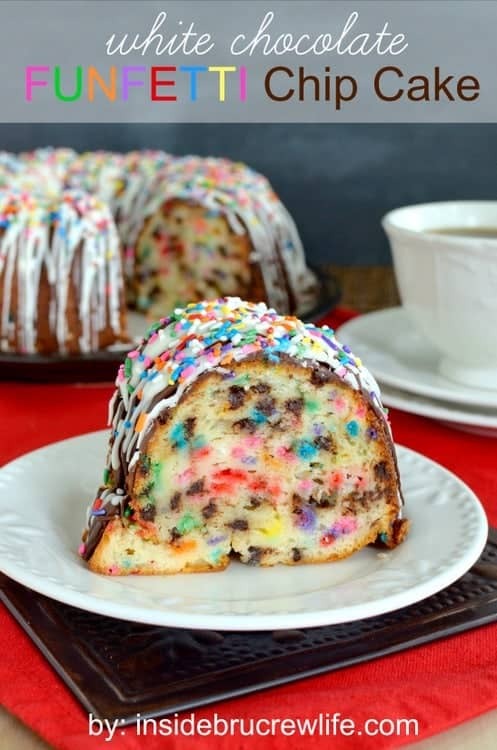 The best part of this cake is that when you cut into it, there are tons more sprinkles and chocolate chips on the inside. You just can’t help but smile when you see this fun cake coming at you. It will make you forget about anything late related. We went to dinner at some friend’s house earlier this week. And no we weren’t late…well…does 2 minutes count as being late? Don’t answer that 🙂 I brought this fun cake for dessert. The little girl there was so excited when she saw all the sprinkles. Her eyes got really big when she saw all the sprinkles inside it too. This cake is so down right delicious, it isn’t even funny. You are going to add a box of white chocolate pudding to the cake batter to give it the flavor. And then lots of sprinkles and chocolate chips are stirred in for a huge WOW! factor. 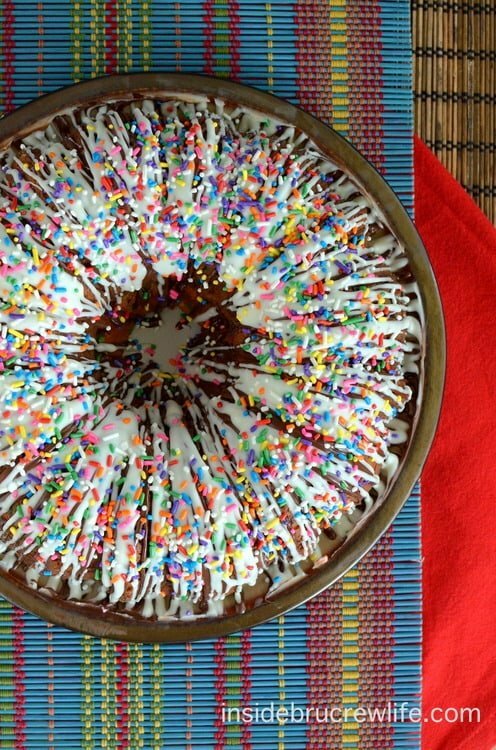 I like to make this cake in a bundt pan, but you could also bake it in a 9×13 baking dish. Just make sure to adjust the baking time. A bundt pan takes much longer because of how deep the pan is. After it cools, drizzle it with 2 kinds of chocolate and give it a healthy covering of sprinkles. What do you mean I was late? Ain’t nobody got time for blame when there is sprinkle cake to eat! 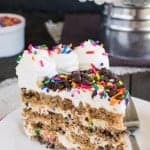 This white chocolate pudding cake with funfetti sprinkles and mini chocolate chips makes an impressive dessert at any picnic or party. Preheat oven to 350 degrees. Spray a bundt pan with nonstick baking spray. In a mixing bowl, combine the cake mix, pudding mix, yogurt, eggs, oil, and milk. Beat on low for 1 minute, then beat on medium for 2 minutes. Stir in the sprinkles and mini chocolate chips by hand. Pour batter into prepared pan. Bake for 55 minutes. Let cool in the pan for 15 minutes before turning out onto a plate to cool completely. Place the chocolate chips in a microwave safe bowl with 1/2 teaspoon shortening. Heat for 30 seconds. Stir until melted and creamy. 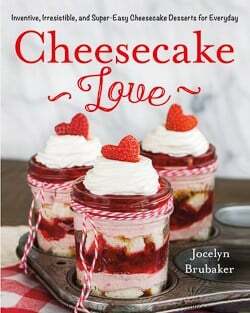 Spoon into a plastic baggie with one tip cut off and drizzle over the top of the cake. 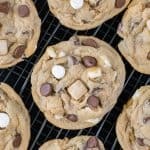 Repeat with the white chocolate chips. Top with the extra sprinkles. Let set before serving. Keep covered on the counter for 4-5 days. How fun is this cake?! I love it. I am late more times than not too :p It’s an awful habit I’m still trying to break. Man this cake is yuuuumy looking! 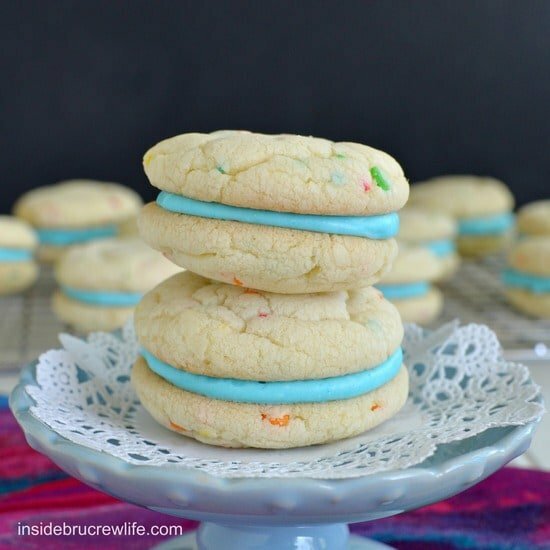 Stopping by from inspiration Monday’s link party! Thanks Lauren!! 🙂 It really is a hard habit to kick! Oooh Perfect! My son’s b-day is Tuesday and he is allergic to chocolate (horrible, right? 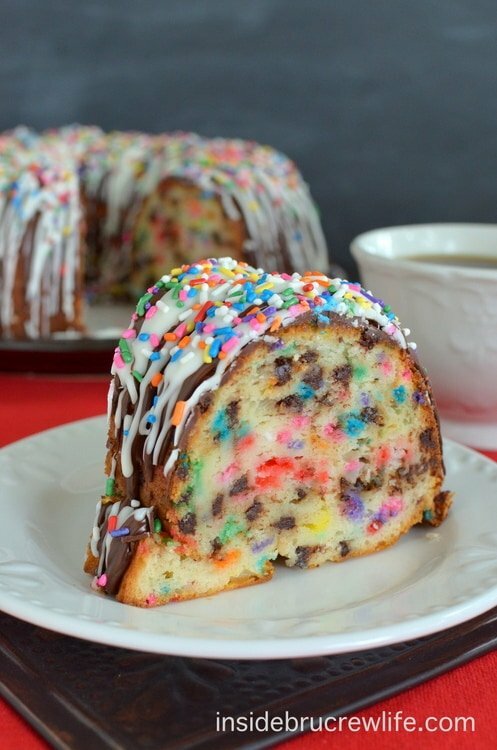 )…but I think this (minus the chocolate chips) would be the most fabulous cake for him! Thanks! And that’s funny that you are always late…I’m one of those super annoying 10 minutes early to everything kind of girls! 🙂 We can still be friends! How stinky for your little man to be allergic! But this cake will still be totally awesome without the chocolatey goodness!! 🙂 I need to learn time management from you! 😉 Sometimes I think there’s no hope for me though, LOL! I love this cake! It’s gorgeous!! I like your thinking! It’s not me, it’s the kids!! Sounds good to me! 😉 Thanks girl! This is where we differ, I am early to EVERYTHING. Obnoxiously early. LOL. This cake looks divine! I feel your pain, reasons, justifications and the ultimate effort to come to try and be better at timeliness, but…it just doesn’t work…all the time. I have your back partner, my hubby the same as yours! He likes to be most places 15 – 30 mins. ahead…really! PS I think this cake would be a great treat for a work treat! Thank you!!! Thank you!! I’m glad I’m not alone in my lateness! 😉 30 min?! Sheesh! That’s just waaaay to early! Lol! 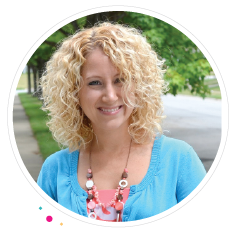 I used to be a total n time person, but then I started my blog and there is never enough time. Never!! So now I am always late, ok not always, but man it is hard! This cake is awesome! So colorful and fun! Yes, all of the blog related things I have to do has not helped me any! I just need more time in a day.. Particularly in the mornings.. 🙂 Thanks Tieghan!! I am not a late person usually and it is one of my hubby’s pet peeves as well so I feel ya.. I always give myself a 10 to 15 min buffer so if I go over it a few minutes its ok because I am still on time! I’m late to everthing too. A bad childhood habit i carried over. It’s caused a good few fights between Dh and 1 . I try my best my tardiness is just one of the drawbacks off having ADHD. I love this cake – late or not! Our family’s standard birthday cakes all had funfetti in them. None at any other time so you’d KNOW you were special. Thanks for the walk down memory lane. I would love to be only 2 minutes late:) But I would love this cake more. Wow, all those sprinkles! This is honestly the most fun and pretty cake I’ve seen in a long time! I’m usually late – my husband is ALWAYS early!! this cake is simply gorgeous! I’m beginning to believe that opposites attract in this department. I’m hearing a lot that one spouse is early and the other is late! I like to think that I balance my hubby in that way 😉 Thanks Mary! Haha, yes kids just add to my lateness!! 😉 Thanks Rachel! I don’t care if you were three weeks late to a party, if you brought this cake with you I’d be totally happy 😀 heehee. Who can say no to all those sprinkles?! Haha!! Now we’re talkin!! 😉 Thanks Jess! I don’t care if you’re late as long as you show up with this cake! That’s what I like to hear!! 😉 Thanks Marcie!! Yes, those sweet little ones of ours make it hard to be on time, much less early!! 😉 Thanks Ashley! This is sprinkle-tastic! I want to dive through the screen and take a big bite! Oh, thank goodness for yoga pants, right?! Squirrel!! I love the combo of funfetti and chocolate chips in this cake. So pretty! Yes, I adore my yoga pants!! 😉 Haha, Thanks Jen!! I’m glad someone got my squirrel reference!! The cake is beautiful! Love all the sprinkles! Eek! This cake makes me happy, happy, happy! 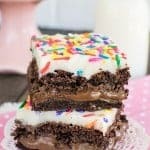 Overloaded with sprinkles and chocolate and goodness.. my kinda cake! I knew you’d like this cake!! 😉 Thanks girl!! Yes please! I love funfetti anything!!! What a fun, colorful cake! Love all of the sprinkles and chocolate! I love Up too!! I’m the exact same way!! Getting up earlier just makes me take my time because I think I’m all good. But then I’m still late!! 😉 Thanks Chels!! I love how fun and colorful this cake is! I’m totally gonna make it with my niece! Thanks for linking up to Wake up Wednesdays!! 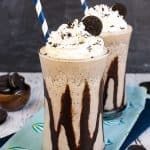 wow that looks amazing! love how colorful it is. I’m opposite of you and tend to be way early since I can’t stand being late to stuff. Blame my type A personality! You’re totally welcome!! Sprinkles definitely just make everything better!! 😉 Thanks Brandie!! I’m newer to your site, but the few things I’ve made have been delectable! I forgot to get the white chocolate pudding and it’s too dang cold here to go back out. Do you thing vanilla pudding will do? I’m making it for a Cakewalk at my kids school. I asked my 9-year-old daughter if she thought it would work. I showed her the picture and she was entranced, licking her lips, shaking her head yes. So funny. Thanks! I am so glad to hear you have made and loved some things from my site. Yes, the vanilla pudding will work just as well. I hope your daughter loves it! 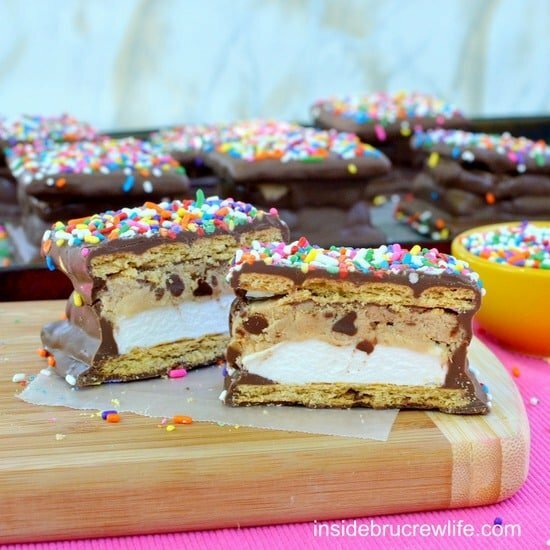 I already have a funfetti cake mix I’d like to use for this. Would I leave out the pudding mix but still keep the greek yogurt, or leave out both? Actually go ahead and keep both for it. 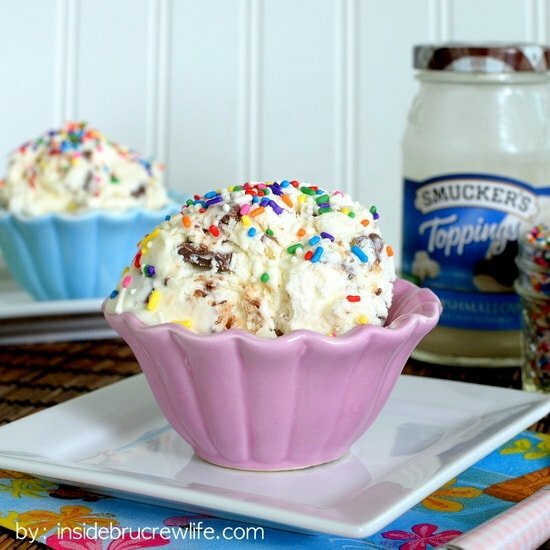 Just don’t add the sprinkles…unless you want to really sprinkle-fy it!! I hope you enjoy it!!! 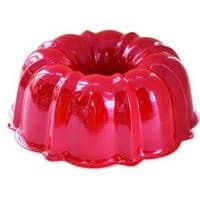 Where do you get your white chocolate jello?? I usually buy it at Walmart, but I think I have seen it at Meijer too. I hope that helps. You can also substitute vanilla if you can’t find the white chocolate. Enjoy the cake!!! I am notoriously late. What’s worse is even though I’m late I still try to make it on time and get SERIOUS road rage! :\ Its terrible!! ha! Making this yummy looking cake for a family reunion this weekend!! Can I sub coconut oil in place of the shortening? I just use the shortening to thin the chocolate for drizzling better. You can leave it out or use coconut oil in place of it. I hope you and your family enjoy the cake!!! This cake looks like so much fun. 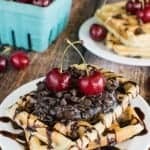 Do you use semi-sweet chocolate chips? I used mini chocolate chips…I think you can buy those in semi-sweet or regular. Use whatever one you like better…it will be fine either way. 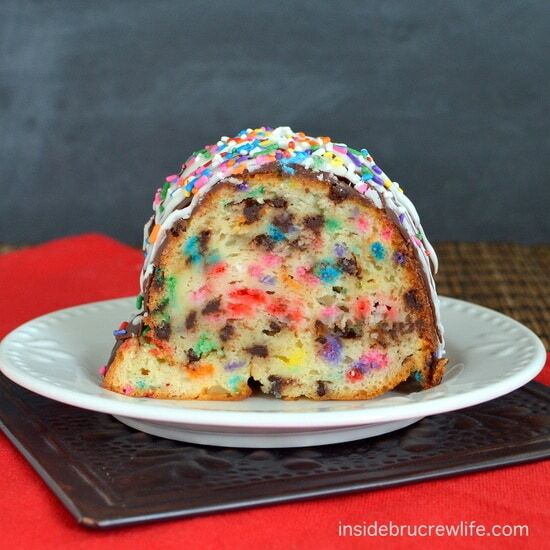 I want to bake this for my daughters Birthday but only have a 9 inch bundt cake pan. How full would you fill the pan and how should I adjust the baking time? Your pan is probably a 10 cup pan. A good rule of thumb when baking in a bundt pan is to only fill it 2/3 full. You can go a little fuller but no more than 1 1/2 inches from the top of the pan. The baking time will need to be adjusted too. 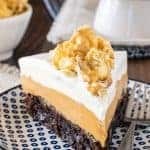 I would start checking the cake at 45 minutes and then take it out when the cake pulls away from the edges and when a toothpick or knife inserted into the center comes out with just a few sticky crumbs on it. Then use the remaining cake batter to bake cupcakes. I hope that helps and that your daughter enjoys the cake. 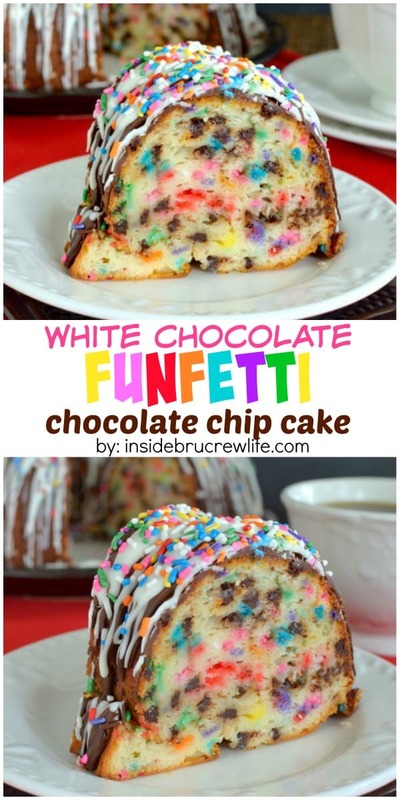 Do you think I can use a Funfetti cake mix (Pillsbury) instead of white cake mix? You sure can!!! I hope you enjoy the cake!! !